Live in Concert! 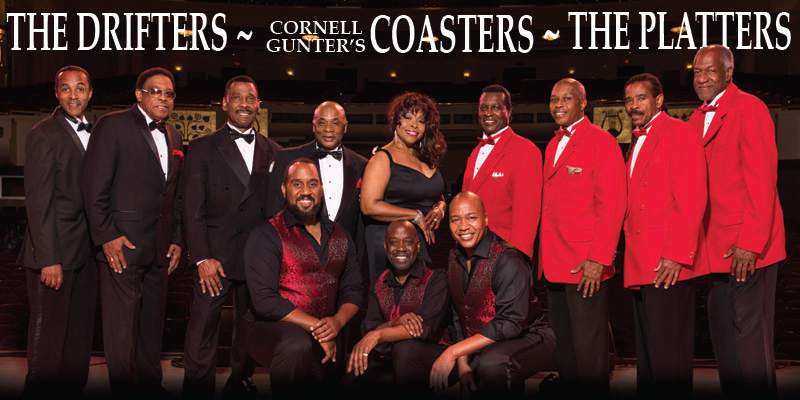 "The longest running music show in Las Vegas History" - The Drifters, Cornell Gunter's Coasters and The Platters. Three rock and roll hall of fame legends on the same stage, for one night only. With more than 94 charted records and 45 top 10 hits combined, you’ll hear favorites like Under The Boardwalk, Stand By Me, On Broadway, This Magic Moment, Up On The Roof, Save The Last Dance for Me, Yakety Yak, Charlie Brown, Poison Ivy, Only You, The Great Pretender, Magic Touch, Smoke Gets In Your Eyes, and many more.